The Black Dragon Tong is a secret arm of the Chinese Boxer movement. Its members dwell amongst the Chinese communities in the great cities of the West. Here they run the opium trade and various other rackets to fund their more nefarious activities. They are hell bent on bringing terror to the heart of the West's governments by targeting senior officials, government ministers and even monarchs and presidents. In London they are led by the mysterious 'Dragon Lady', who is said to breathe poison and have a fresh Englishman's heart for breakfast every day. Few, even among the tong membership, can describe her appearance accurately or consistently – there are even rumours that she can change form. The most common description is of a statuesque woman of indeterminate age, dressed in long, flowing, decorated oriental robes and fighting with a deadly combination of unarmed combat skills and Mystical Powers. The Dragon Lady’s senior lieutenant is Master Wu-Jen. He, and a few more junior lieutenants, act as the interface between the Lady and the rest of the tong. Wu-Jen is an expert warrior both unarmed and with his favourite butterfly sword. He fights unarmoured but, like the other Lieutenants, has the advantage of a few Mystical Powers granted to him by the Lady. The Tong can field three types of “soldier”, all driven to some extent by opium addiction. Of these, the toughest is the Dragon Warrior. These fanatical martial artists are heavily tattooed, unarmoured and fight with two handed swords or halberds. 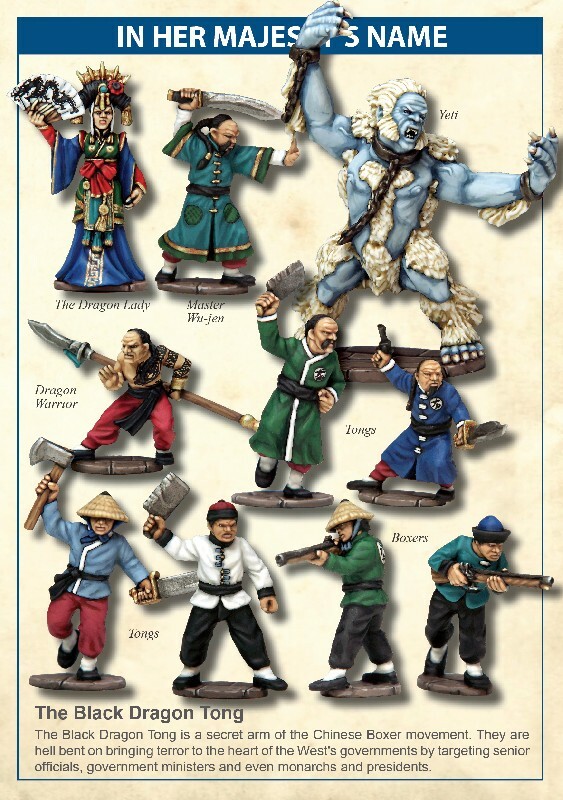 The Tong members are also fanatical, but not as well trained as the Dragon Warriors. They tend to be lightly armoured and fight with knifes and pistols. The third type of soldier is the Boxer – perhaps best characterised as “rabble”. They have little in the way of fighting skills, no armour and only archaic muskets and hand-to-hand weapons. But there are an awful lot of them, and if they are inspired by the Dragon Lady’s powers they can fight fanatically to the death. The most fearsome fighter available to the Dragon Lady is, however, not a human – it’s a Yeti. These are very rare beasts and she is unlikely to be able to field more than one in any given fight. A Yeti is very tough in close combat and is driven mad with rage when injured – making it even more dangerous to the opposition, but also potentially to its supposed allies.